I'm going to be a "maybe" on this. Reason's stated earlier in the post. I want to see if the things I've done to my Mini are actually making it quicker, but the distance and lack of organisation at these events winds me up. Hope it works out better than Pod which is getting worse for queuing. 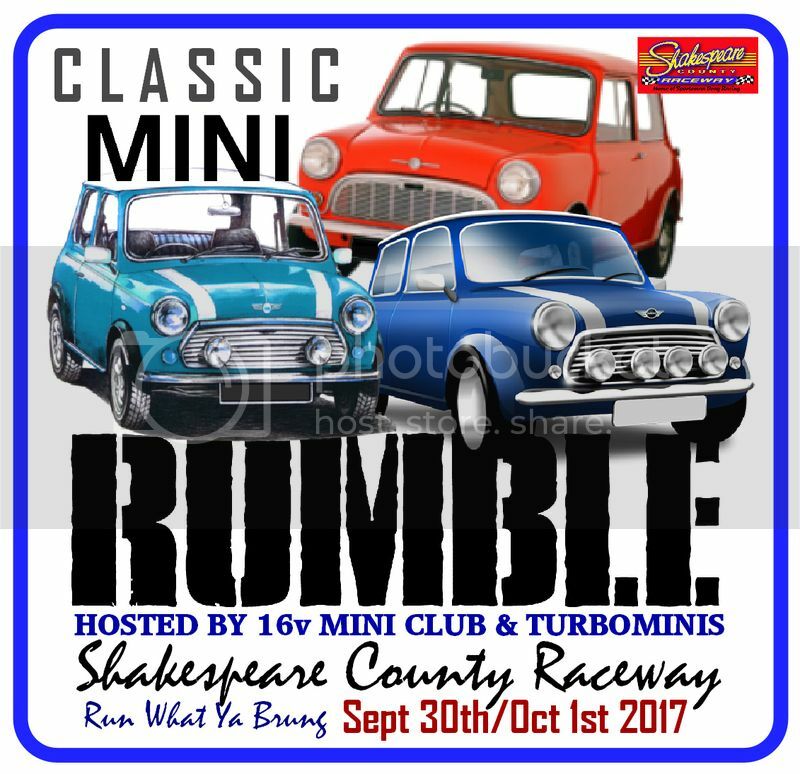 The event is now officially called the 'Classic Mini Rumble'. Shakespeare raceway has kindly produced a web banner and will be adding it to the events listing. That's so cool. I've got to go now. Does it have to be road legal? I'm in. Don't know what the car will be running by then though. I'll be there at some point, not sure if just for a day or weekend yet though. The camping are will be wherever we choose when we get there, hopefully near the pits so people can park on the concrete to do and last minute tweaks. I have spoken to Shakespeare county raceway and they are happy to host our club meet There will be camping available and we will try and organize some sort of bbq for the Saturday night, Shakespeare raceway have also said the bar will be open if there is enough of us. I'm hoping people will make the effort to get to this as it would be great to finally have a good club meet so even if you have no interest in going on the track please come along and meet everyone else, talk minis, watch some racing and hopefully have a fun weekend. let me look at work! has anyone given in a plug on the 16vminiclub facebook page ?